When traveling, it is always great to plan out your outfits so that you can maximize the space in your suitcase and wear something more than once. 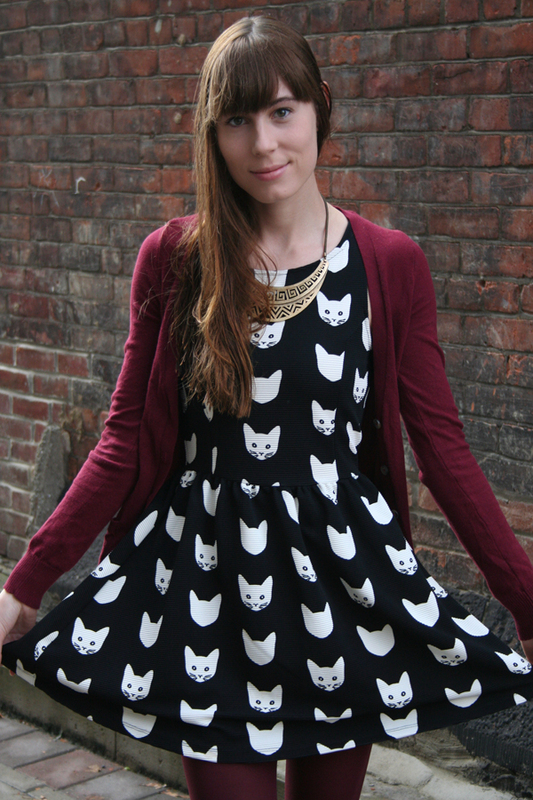 I usually bring pieces that can be worn a couple of ways just by changing your accessories, and this little cat dress is the perfect thing to do just that. 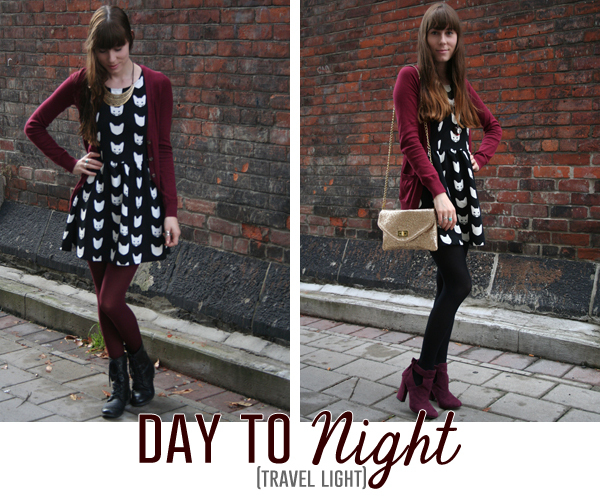 By changing my shoes, tights, and purse, and necklace, I can easily go from day to night! During the day I kept it comfortable and casual with my combat boots and coloured tights, and added a fun statement necklace to dress it down. I was also lugging around my giant tote purse, but it was so full and bulging that I didn't include in these photos, haha. For the night I switched my colored tights for more conservative black ones, and changed out my tote for a smaller, sparkly cross-body. Heels immediately dress any outfit up, and I switched my necklace to pull it all together. Normally I would have ditched the sweater, but it was chilly and I would have been pretty cold without it! Thanks so much for stopping by! Which outfit would you more likely wear? Let me know in the comments! 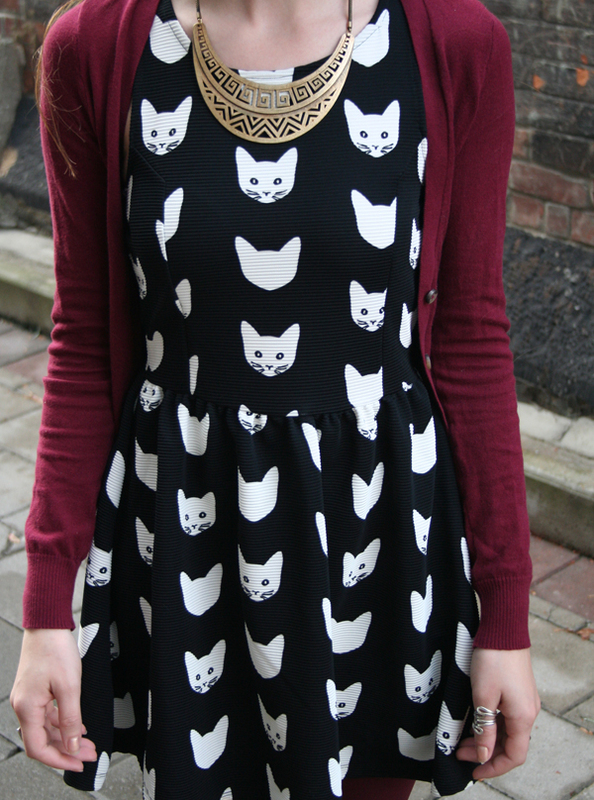 I used to be all about a nice bird print dress, but I may have to adopt the cat print. This dress is too adorable. I love these colors together! I would probably wear the first outfit because I tend to dress more comfy than anything! 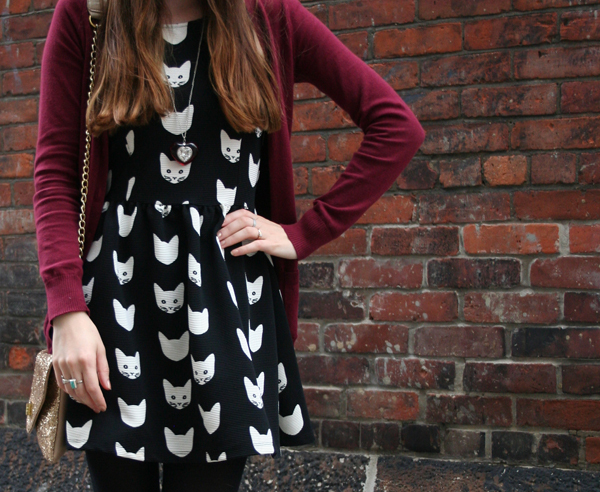 The cat dress is fabulous and I love the purple booties! This is a great outfit! That's a very stylish outfit and it is in harmony with your beauty.